If I’m knitting, I’m not posting. If you’ve visited recently, you may have noticed that I am currently doing the former. 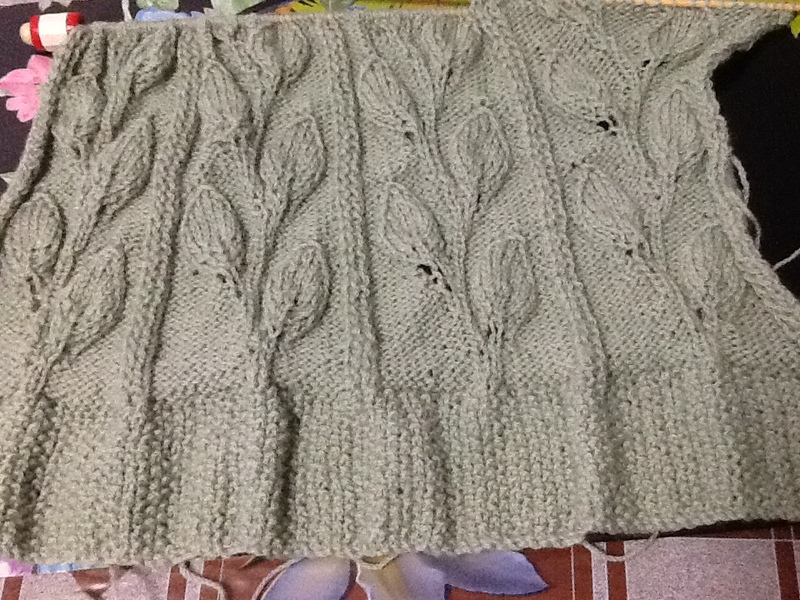 I thought I might combine the two in the only way I could physically do it and am inserting a photo of a half knitted pram rug of trailing leaves. It’s my favourite pattern but unlike the granny squares, this pattern requires me to focus on each row. I have a friend who was an only child. Who would have known she was going to mutate into a matriarch of (almost) 8. I crocheted a granny square blanket for her first grandchild, then the second, knitted one each for the next two and so it went. It was expected, I couldn’t do for one and not the other of my friend’s four children. Now I’m hoping it ends here. My arthritic fingers can’t take it any more. That’s a lovely pattern, Mary, and I’m a tad envious of your skill. My knitting never progressed beyond basic. I can cast on and off, and I can do a simple knit and purl. I’ve made many a winter scarf in my day. I’m sorry I haven’t been in touch. Things are a bit topsy-turvy here, and we are busy preparing for granddaughter’s visit in mid-July. Hope you and your family are well. Darling Maddie, so lovely of you to pay a visit and glad that busy as you are you haven’t totally dropped out. I’m always saying that (being only variations of the knit and purl stitch) if you can knit and purl you can work to a pattern. But who has the time, these days. I keep wanting to hang up the needles, but babies seem to get in the way of this ambition. I know how you go all out when your granddaughter visits. Have a fabulous time, Maddie. Hugs. Anything handmade makes an extra special gift, well worth the effort Mary!